We were addressed by newly appointed CEO Mr. Peter Donkersloot Ponce. Mr. Ponce emphasised his commitment to the company, its shareholders and Jamaica. He also urged shareholders to be prepared to defend Crib Cement’s market share against cheaper subsidies imports, he closed by reiterating that he and the company has an open door policy and welcome input from shareholders. 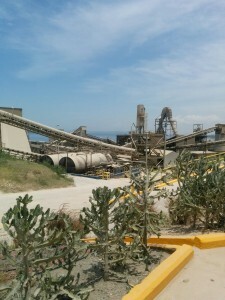 The tour of the plant started by the limestone storage building which had a capacity of over 60,000 metric tonnes. The tour then moved on to mill five which is one of the two operating mills on the plant. The Cement Mill 5 is a towering structure which has a hammer to crush the material very fine to produce the end product. The lime stone and other raw material are loaded in the mill from the quarry cite. On our next stop, we were introduced to Kiln 5, where clinker is produced. The kiln is a massive cylindrical iron tube which generates a lot of heat. Kilns are used for pyro processing of the ingredients and is a long cylinder rotating about on its axis. The axis is inclined at a slight angle with the burner being lowered. CCC is currently operating Kiln 5 which is integral to the company’s operation. 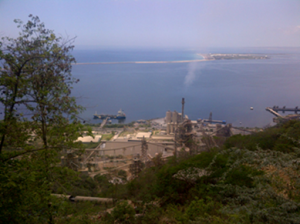 The Kiln 5 started producing cement in September 2008 after two years of construction. According to Mr. Stephenson, the kiln is one of the most efficient burners and is approximately 40% more efficient than a wet process applied in kiln 4. The shale which is sourced from St. Thomas and the limestone that is mined on site are grounded finely and blended to a fine grey powder and then fed into the kiln. The kiln 5 generates a significant amount of heat; the material entering the start point does so at 900 degrees Celsius while the other end of the kiln generates heat of approximately 1,600 degrees Celsius, creating a reaction between the mixture and the heat. The end result is the formation of clinker minerals. Kiln 5 has a max capacity of 3,000 tonnes of clinker per day this is significantly more than the capacity of prior kilns one (1) to four (4). As indicated above, Kiln 4 which is not in use but still operational, utilizes the wet process which incorporates water, as indicated by its name. The major difference between the wet and dry process is the mixture fed into the kiln. For the wet process, after grinding limestone and shale together, water is added to create a slurry mixture. This mixture is then transported into a kiln, dried and then processed by the kiln’s heat into clinker. The wet process normally takes a longer time as the mixture of limestone, shale and water needs to be dried. Gypsum is also grounded into both mixtures to slow the reaction time of cement. After the clinker is made, it travels to the cement mill. If the local and export demand should increase, CCC is capable of restarting kiln 4 to meet the rise in demand. Mr. Stephenson and Ms. Lowe noted, however, noted that the capacity of Kiln 5 is well above the local demand. We then went to the quarry where limestone is extracted; this is located above the plant. The limestone is extracted using two methods, ripping and blasting. Ripping is done by tearing away the rock in a rough or vigorous manner from the mine, while blasting involves drilling holes into the rock and planting a calculated amount of explosives so that the volume of material is broken up. Both methods are useful but the determining factor for each method is the type, density and strength or the rock being mined. Our stop at the quarry took us to the hopper where the mined limestone is transported from the quarry down to the plant. Under the hopper is a laminated feeder (also known as a metal conveyer) which takes the crushed material to a hammer. According to Mr. Stephenson, “The hammer then crushes the material and then goes on another conveyer and travels down the hill” to storage. 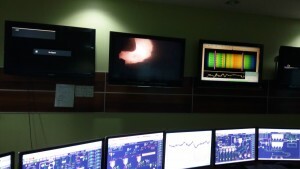 Our final destination on the tour was the control room which was described as the place where all the magic happens. In this room operators control the various sections of the plant. The operators are able to view the transformation of the raw materials to the final product and manage the process as required. These operators makes changes as necessary using a program called mimics while working in tandem with workers on the “ground”. CCC operates on three (3) shifts and is a twenty-four house operations. With such a massive plant and a 24 hour operations, questions regarding the longevity of the Kiln 5 and Mill 5 as well as maintenance were raised. Mr. Stephenson stated regular maintenance is done. It was also noted that the nature of these maintenance exercises has been geared towards the performance of the equipment with a view to reduce the down time. On the subject of the useful life of a kiln, both Mr. Stephenson and Ms. Lowe hinted that it was difficult to determine, as the life of a kiln or mill depends on what is more viable for a company, as well as the progress of technology. Our tour ended at the newly renovated Carib Cement sports club.